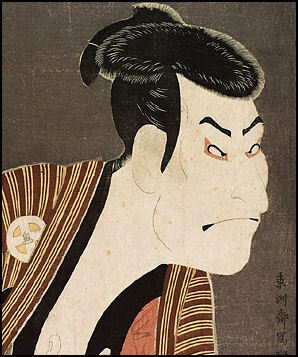 Actor by Sharaku Kabuki is above all else an actor’s theater, with the plays serving primarily as vehicles for highlighting the talents of the stars. While many kabuki fans undoubtedly have preferences with regard to the plays, most will come to the theater to see their favorite actors regardless of the role or play. Each actor is part of an acting family, and each family has a specific style and approach to each role. In the kabuki world, junior actors usually learn from senior actors regardless of their family affiliations, particularly when they first perform important roles. The iemoto (headmaster) system has traditionally been prevalent method of instruction. It is a system that stresses obedience and discipline and is closely associated with the styles, secrets and traditions of the headmasters who run it. There have often been conflicts between the iemoto system and individual actors. who have wanted to express themselves in their own way. These days many Kabuki actors show up play regular roles on television and in films. Most actors have been trained in family run schools, many of which get their names and styles from famous kabuki actors. Children regard their teacher-father as a master and use formal language when communicating to him even at home. Important kabuki schools include Bando Ryu, the Ichikawa Ryu, and Matsumoto Ryu. They are all associated with famous actors of famous acting families. Wagoto is a young man about town, usually elegant, even effeminate, and most often in love with a famous courtesan. He may be a hero but he is often also a vain and even slightly comical character. This role category was the creation of the actor Sakata Torujo (1647–1709). 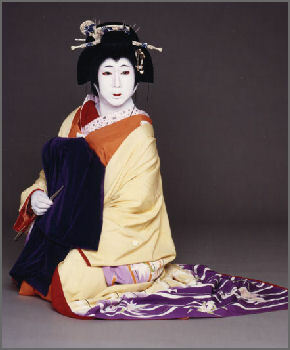 Wagoto’s white make-up and costuming were based on the urban fashions of the Edo period. Aragoto (wild warrior style) refers to strong, even aggressive male characters that may be good or evil. With their flashy, exaggerated acting technique, stylised make-up, heavy costuming and often with high shoes they are, both metaphorically and literally, “larger-than-life” characters. This type of role was created by a famous actor from Edo, Ichikawa Danjuro I (1660–1704). The aragoto type of character became extremely popular and the actor lineage, founded by Danjuro I, still continues to maintain the tradition today. Besides the three main role categories discussed above, wagoto, aragoto, and onnagata, each with their own sub-categories, there are several minor types of role. Katakiyaku, with its own various sub-categories, refers to villains, sabakiyaku types are good, righteous male characters, jitsugoto refers to characters based on historical personalities, while sanmaime types are comic male characters. The Kabuki student already starts dance training in his childhood. He must familiarise himself with a vast repertoire of dances, particularly if he specialises in the onnagata roles. In most of the noh-derived kabuki plays it is dance that dominates. Even in the plays in which dance does not dominate, the exaggerated acting, with its fixed role categories and their specific techniques, approaches dancing very closely. As kabuki is, to a great extent, a hereditary profession, its training is done within the acting families. The student may have separate classes in dance and in music, but otherwise an older master transmits whole roles and their minute interpretations to younger actors. Only an extremely experienced and venerated actor may dare to make slight changes in the interpretation, which has been maintained and cultivated by a family line that stretches back for generations. The onnagataoften have movements more feminine than those of real women. During performance they walk delicately with their knees pointed inward and stand sideways to take attention away from the broad masculine shoulders. A tengui hand towel is used to enhance female sensuality. During their training they are taught to walk like a woman by having their legs tied together at the knees. Nakamura Sikan, an onnagata specialist who has played female roles for more than 50 years, said that he was chosen for the roles because he was small and came from a long line of onnagata actors. Explaining his art, g, Nakamura told the Daily Yomiuri, "To be a man, to be able to objectively watch women is one thing, but their's something more to it than that, and this is indescribable. I used to pay careful attention to women’s manners and speech. I would use that knowledge later on stage. But, even with that wealth of knowledge, I'm afraid I don’t understand women any better than any other man." Kamakura Gongoro in 1895 Famous kabuki actors include Ichikawa Ennosuke, the developer of Super Kabuki and an actor that has done more than 5,000 flying scenes; Nakamura Kichiemon II, who had performed kabuki so long he can't even remember his first performance at the age of four; and Nakamura Sikan, an onnagata specialist who began perform ingat five and was still going strong in his 70s. Al three actors come from famous kabuki families, which have been involved in drama for many generations. Many famous actors from kabuki families began training at two, cajoled with sweets, and made their debuts when the were four or five and performed into their 70s and 80s. There is an obsession with family lineage. 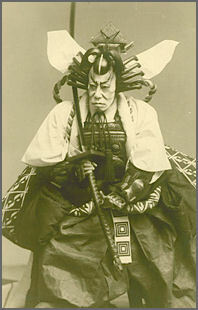 The great kabuki actor the seventh-generation Koshiro Matsumoto performed part of Benka in the play Kanjunchi 1,600 times. His grandson ninth-generation Koshiro Matsumoto performed the same part 900 times between age 16 and 64 and has his eye on his grandfather’s record. A great deal of attention was given to the assault of popular kabuki actor Ichikawa Ebizo in a -barroom fight at a club in Minato Ward if Tokyo in November 2010. Ebizo was hospitalized for two weeks with a broken cheekbone, broken teeth, bloody eye and other injuries sustained in the fight. Surgery was performed on his cheek bone to make sure it didn’t interfere with breathing in his nasal passages. Twenty-six-year-old Rion Ito---a half Japan, half African-American bozuzuka motorcycle gang member---was charged with assault. Prosecutors sought a two year prison sentence for Ito on assault charges based on allegations that he slapped Ebizo in the head and face and kicked him in the abdomen. By that time Ebizo said he didn’t want Ito to be tried, insisting he had settled his differences with the man. In February 2011, Ito pleaded guilty to charges of assaulting and injuring Ebizo. The media sometimes referred to Ito as a “hafu,” a somewhat derogatory term used to describe people who are half Japanese. In early morning hours after the incident Ebizo---known in some circles as the Kabuki Prince---returned home and his wife---a former TV announcer Mao Kobayashi on News Zero “called for an ambulance at 7:20am, saying “My husband has come home injured, According to insiders this was a big mistake. She should have called people in the kabuki community who could have arranged for help for the actor without drawing publicity. Ebizo and Kobayashi were just married the previous July. Their glamorous wedding was televised and recieved a great amount of media attention. She was preganant at the time of the fight. A the bar where the fight took place Ebizo apparently got into conversation with a group that included Ito and man described the former leader of a bozuzuka motorcycle gang, and then began drinking with them. He has told the police that he was struck without warning when he was trying to assist a drunken friend. Blood from several individuals was found at the scene of the fight. Anonymous witnesses said Ebizo’s behavior when drunk could be quite bad and said he had been barred from other bars in the past. Ito was quoted as saying “It’s true I punched him...I got angry. I was the only one who punched him. But it wasn’t me who picked a fight.” Ebizo said the man picked a fight with him and punched him suddenly while was taking care of someone go had passed out while drinking. Some witnessed at the bar said Ebizo became aggressive. Ito said he was tying to defend a friend---a former leader of a bike gang---who was head-butted by Ebizo. The former bike gang leader told police Ebizo had been aggressive when trying to assist him but had not actually physically attacked him. There were some reports that ex-gang leader claimed he had received injuries requiring 10 days of treatment, including a bloodied nose. Ebizo returned to the stage in Tokyo in July 2011 after a hiatus of several months. . Ebizo along with his father, Ichikawa Danjuro, appeared in one of a series of kabuki shows, making a comeback in front of a sellout crowd after his last previous performance in Kyoto in late September 2010. In March 2013, Ichikawa Ebizo performed the lead roles at the March Hanagata Kabuki show being held at Le Theater Ginza, featuring various appealing elements of the traditional theater style. Ebizo said the event is meant to cheer up fans of the art and to pay tribute to his father, Ichikawa Danjuro. Text Sources: Dr. Jukka O. Miettinen, Asian Traditional Theater and Dance website, Theater Academy Helsinki; New York Times, Washington Post, Los Angeles Times, Daily Yomiuri, Times of London, Japan National Tourist Organization (JNTO), National Geographic, The New Yorker, Time, Newsweek, Reuters, AP, Lonely Planet Guides, Compton’s Encyclopedia and various books and other publications.